This was a fantastic book. Make sure to have Kleenex ready because you will need lots of them. I did not want to put this book down because I had to know how this family was going to cope with the tragedy that struck them. Each member of this family needed to learn to cope in their own way. This explains many aspects of a tragedy with beautiful words. I received a copy of this book from Celebratelit for a fair and honest opinion that I gave of my own free will. When tragedy strikes, Maggie discovers a mother’s love never ends—not even when her life does. Longing for her family after her death, she returns home where she helplessly witnesses her family’s downward spiral in the aftermath of her passing. Her husband is haunted by past mistakes and struggles to redeem himself. Her teenage daughter silently drowns in her own guilt, secretly believing she is responsible for her mother’s death. Only her five-year-old, full of innocence, can sense her presence. Although limited by her family’s grief and lack of faith, Maggie is determined to keep a sacred promise and salvage her family before her second chance runs out. A tender portrait of a mother whose love reaches beyond possible, Waiting for Butterflies will embrace your heart and not let go. K. Sargent PicKaren Sargent creates characters whose imperfect faith collides with real-life conflicts, taking readers on a journey through grace and redemption to discover enduring hope. A romantic element is woven within each story. In addition to writing inspirational novels, she blogs at The MOM Journey…where moms aren’t perfect and that’s perfectly okay. Her writing has been featured in Guidepost’s Angels on Earth magazine and on ForEveryMom.com. When she is not writing, she teaches high school and college English in the beautiful Arcadia Valley where she resides with her husband and two daughters. Visit her at KarenSargentBooks.com. I didn’t intend to write myself into controversy when I wrote Waiting for Butterflies. Yes, it is Christian fiction. Yes, the main character is a “lingering spirit.” And no, ghosts aren’t biblical. Thus the controversy. As the story idea began to stir my imagination after my mother-in-law’s unexpected death, I wondered how ghosts fit into the Christian view of the afterlife, especially since I too believe our souls go to Heaven once we die. So I asked my pastor. He referred to Hebrews 11, the “Faith Hall of Fame” that lists Abraham, Isaac, Jacob, Moses, and many spiritual giants who lived by faith. That list is followed by Hebrews 12:1 which states, “Therefore, since we are surrounded by such a great cloud of witnesses…” My pastor explained witnesses is translated by some to mean spectators. So maybe, maybe, this suggests those who have died can somehow still be present—emphasis on maybe. But…this gave me just enough permission to play with the idea of a mother’s love being so strong that she could remain after her death until she was certain her family would heal. I was writing fiction after all. When my manuscript was complete and I began submitting to agents, the response was mixed. Some replied with a simple, “This story isn’t for me.” Some warned, “This will be a hard sell to Christian publishers.” Yet others were more encouraging. Finally my story made it to the desk of an acquisition editor who emailed, “This is the one.” Waiting for Butterflies found a publishing home. Now that my book is in the hands of readers, most are surprised to hear my topic is controversial. Like me, many believers haven’t really considered ghosts in a biblical context. But a few are adamant that the storyline contradicts their beliefs. 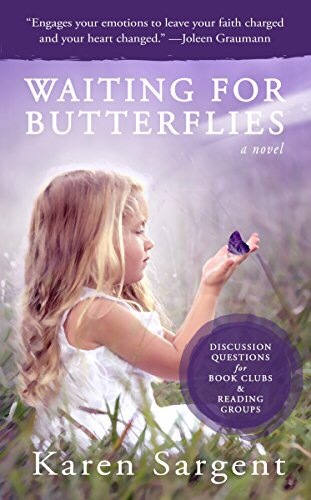 I appreciate that in spite of the controversy, this reader gave Waiting for Butterflies a chance—and five stars. This is a very sweet children’s book. It talks about how everyone will love you always. Your mother, your father, grandparents and others. It is well written and has wonderful illustrations. I received a copy of this book from Worthykids for a fair and honest opinion that I gave of my own free will. A child is a treasured leaf on a family tree, surrounded by love from mom, dad, doting grandparents, aunts and uncles, and family friends too. This sweet, reassuring picture book from Eileen Spinelli acknowledges the whole “tree”—the many who are invested in a child’s life—with expressions of unconditional love from each. Heartwarming verse and charming artwork will make this book a must-buy for baby showers, birthdays, and other occasions. Eileen Spinelli spent Saturdays at the public library as a child, and it was there that she decided to become a writer. She’s authored more than fifty children’s books, including Somebody Loves You, Mr. Hatch; The Best Story, and Two to Cuddle. Eileen lives in Media, Pennsylvania. When she and her husband, Jerry, who’s also an author, are not writing, they are hanging out with their grandkids (30 and counting), playing Scrabble, reading, watching old movies, and raising Monarch butterflies. Gillian Flint has had a passion for drawing and creating characters for as long as she can remember. She creates her illustrations by mixing and matching watercolors, crayons, ink, and digital illustration. In her spare time, Gillian enjoys reading, spending time with her family, and pottering about in the garden on sunny days. This is the first book that I have read in this series but it won’t be the last. This is a wonderful murder mystery. I could not put this book down. I really like Liam and his wife Catherine. They work so well together. This is the fourth book in the series but you don’t have to read the first three to enjoy this one but I hope to read the others sometime. This book takes Liam back to Ireland to help solve his Uncles murder. Liam has a lot of thinking to do during this time. I received a copy of this from St. Martin’s Press for a fair and honest opinion that I gave of my own free will. The newest novel from Ronald H. Balson, the international bestselling author of Once We Were Brothers, finds private investigator Liam Taggart returning to his childhood home for an uncle’s funeral, only to discover his death might not have been natural. When his uncle dies, Liam Taggart reluctantly returns to his childhood home in Northern Ireland for the funeral―a home he left years ago after a bitter confrontation with his family, never to look back. But when he arrives, Liam learns that not only was his uncle shot to death, but that he’d anticipated his own murder: In an astonishing last will and testament, Uncle Fergus has left his entire estate to a secret trust, directing that no distributions be made to any person until the killer is found. Did Fergus know, but refuse to name, his killer? Was this a crime of revenge, a vendetta leftover from Northern Ireland’s bloody sectarian war? After all, the Taggarts were deeply involved in the IRA. Or is it possible that the killer is a family member seeking Fergus’s estate? Otherwise, why postpone distributions to the heirs? Most menacingly, does the killer now have his sights on other family members? This has to be one of my favorite books of the year. I loved it. It made me laugh a lot and then cry . I did not want to put this book down. Hazel, Diane and Meghan are three generations of one family. Meghan is injured and goes to her grandmothers(Hazel ) to recuperate. Diane, Meghan’s mother, comes also to visit. These three women love each other but have some issues with each other. At this time, Diane and Meghan, learn that Hazel had a sister who had disappeared 70 years ago. Each of these women must learn to trust in God and have faith. I received a copy of this book from bloggingforbooks for a fair and honest opinion that I gave of my own free will. Three generations of women have had issues with their relationships due to a childhood trauma which affected how each girl was raised. When Hazel was ten, her three-year old sister disappeared while under her care and was never found. When Hazel’s granddaughter Megan, an investigator, finds out the truth, she begins an investigation that goes back to Arkansas seventy years ago when Hazel was a child. Megan begins to see how things that happened in their past makes them who they are today. I really enjoyed this story. This is a wonderful historical fiction romance. I enjoyed Mac and Lily. I loved the minor characters of Blake and Aunt Hilda. Lily must learn to stand up for herself against a bad guardian. Mac has to get beyond his past. I received a copy of this book from Barbour for a fair and honest opinion that I gave of my own free will. During a land ownership disagreement, Captain McAlister ends up becoming friends with Lillyanna Laughlin. He shows her what true love could be but he is not financial stable enough to support them. Now she is forced to make a decision between true love or financial security. This was a new author to me and I am so glad that I read this book. This book had a lot of suspense with many twists and turns. I hope there will be more books with Ruth. It is nice to see a female journalist in the WWll era. Ruth learns to trust in God again while trying to figure out why he lets bad things happen. Ruth needs to learn what happened to her sister and why she didn’t know much about her any more. I received a copy of this book from Celebratelit for a fair and honest opinion that I gave of my own free will. Journalist Ruth Brown’s sister Jane is pronounced dead after a boating accident in April 1942. Because Jane’s body is missing, Ruth is convinced her sister is still alive. During her investigation, Ruth becomes suspicious about Jane’s job. Eventually Ruth follows clues to war-torn London. By the time she uncovers the truth about Jane’s disappearance, she has stumbled on black marketers, resistance fighters and the IRA – all of whom may want her dead. linda-eLinda Shenton Matchett is a journalist, blogger, and author. Born in Baltimore, Maryland, a stone’s throw from Fort McHenry, Linda has lived in historical places most of her life. She is a volunteer docent at the Wright Museum of WWII and as a Trustee for the Wolfeboro Public Library. Active in her church Linda serves as treasurer, usher, choir member, and Bible study leader. She is author of several romance novellas and novelettes. 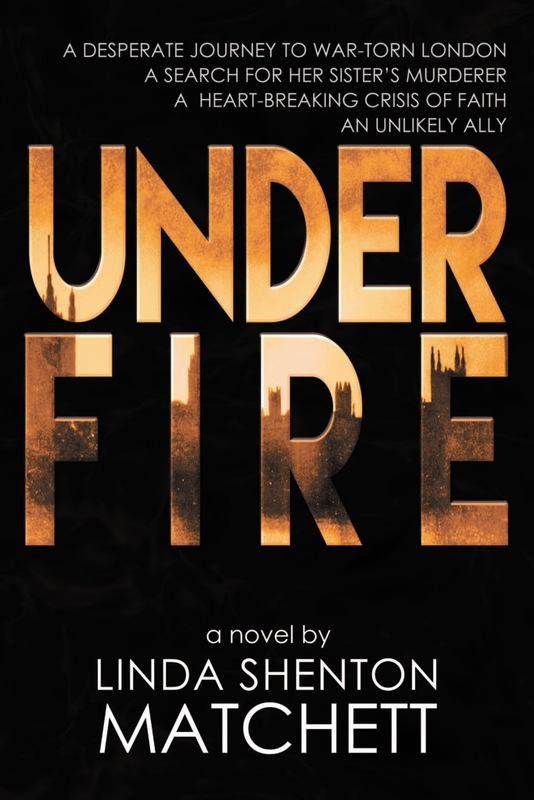 Under Fire, the first in her trilogy about amateur sleuth/war correspondent Ruth Brown, has just been released by eLectio Publishing (electiopublishing.com). Writers are often asked where they get ideas for their stories. Many authors start with a “what if” scenario (e.g. what if the fate of a world lies in the hands of a young man who must return a ring of great power to its place of origin: The Lord of the Rings). Other authors find inspiration in news articles (Agatha Christie’s Murder on the Orient Express). I begin my stories by creating the main character. As a former Human Resources professional, I am fascinated by the history of women’s employment and enjoy reading about those who trail blazed in industries and positions formerly dominated by men. When I was trying to decide what my protagonist should do for a living, I knew she needed a job that allowed her freedom of movement, but nothing seemed to fit until I saw a museum exhibit about women war correspondents. Of the 1,600 journalists who received government accreditation, only 127 were female. In order to get a sense of what these women experienced (derision, hostility, sexual harassment, and more) I read their memoirs, autobiographies, diaries, and articles. As an accredited correspondent they were supposed to received meals, transport to the front, and transmission of their articles. Many military officers refused to take the women into combat zones, so they had to get there any way they could, such as Martha Gellhorn who stowed away on a hospital ship and hid in the head to reach Normandy and cover D-day. It is my hope that Under Fire honors these brave and tenacious women in some small way. I love reading books about the theater in London. This book was so good. I loved the characters of Rosalyn and Nate. This book had a few twists and turns throughout this wonderful historical fiction romance. Each character learns to trust in God again. They each have to grow in faith. I received a copy of this book from Bethany House for a fair and honest opinion that I gave of my own free will. In the 1880’s, during the Victorian era, Rosalyn Bernay takes a job backstage at a London theater. She decides to pursue a career on the stage. Nate Moran is on temporary leave from the Army and can’t wait to return to his regiment. He takes a night job as a stagehand at the theatre. Meeting the beautiful Rosalyn interrupts his plans to leave.